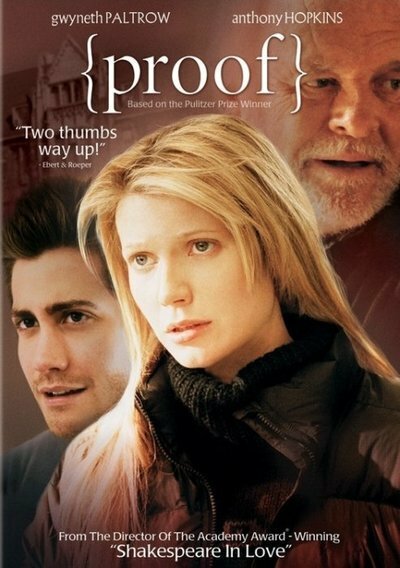 Proof, starring Gwyneth Paltrow, Anthony Hopkins, and Jake Gyllenhaal, centers around the stuggle to determine where genius turns to madness. Hopkins falls into the roll of the mathematical genius turned crazy old man as Robert and Paltrow falls in as the only slightly crazy daughter Catherine, struggling to come to terms with the state of her life and deteriorating sanity. Jake Gyllenhaal is a scholar mathematician (geek) drawn to both of them for different reasons. Most of the movie is dedicated to watching Catherine slowly lose it, which is fairly unsettling considering this is the first time I’ve ever seen Paltrow attempt a role like this. The casting seems as backwards to me as Cameron Diaz as Cusack’s wife in Being John Malkovich – and maybe that’s what makes it most interesting. Hopkins gives a flawless performance as the genius & insane wily-white-haired old man still in love with the Dewie Decimal System. His long winded and eccentric rants are mesmerizing, and the highlight of the film. Gyllenhaal plays an enamoured student of mathematics as anxious to get inside Roberts mind as to find his way into Catherine’s heart. I’d gauge the pace of this movie somewhere between slow and really slow – most of the time when it doesn’t feel like an original formula it feels like the merging of things that have been done before. Like a cross between A Beautiful Mind and Good Will Hunting (without the chemistry between Robin Williams and Matt Damon), it’s interesting but never entirely new or exciting.